CDR’s LT-Thermoplastics are made to exacting standards, ensuring that we hold true to our mantra – Patient Comfort is Accuracy. 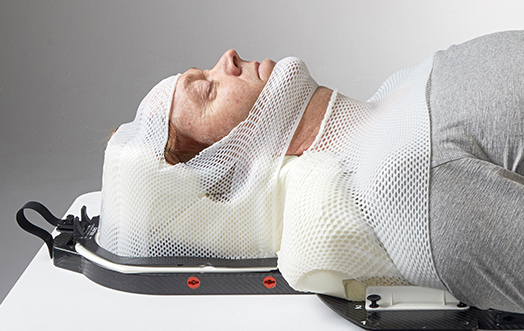 Prone Mask set ensures correct support for prone patients. Click here for additional information on the Prone Immobilization System. Engineered for ultimate patient comfort. 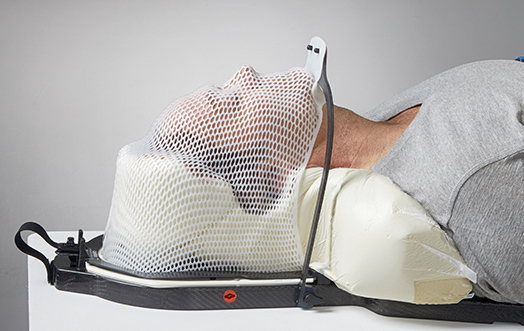 This mask never covers the patient’s face, making it especially ideal for claustrophobic patients. The CDR Hybrid Open Immobilization Mask is proven and the mask of choice for Optical Surface Imaging systems. 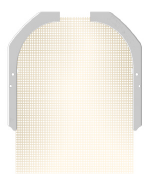 The Shoulder-Tech™ Drape is designed to be used in conjunction with the FreedomX™ System SRS and Head & Neck Module. Working in collaboration with the Intuition Click™ System and a LT-Thermoplastic Split Frame Drape type mask, the Shoulder-Tech™ Drape is easy to apply and provides shoulder immobilization while remaining extremely comfortable. 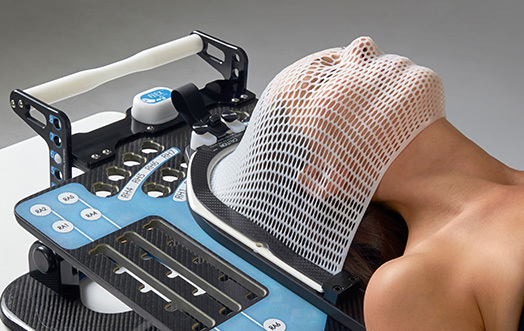 The SaBella Flex™ Support Module allows for the use of thermoplastic masks to aid breast positioning. See SaBella Flex™ here. 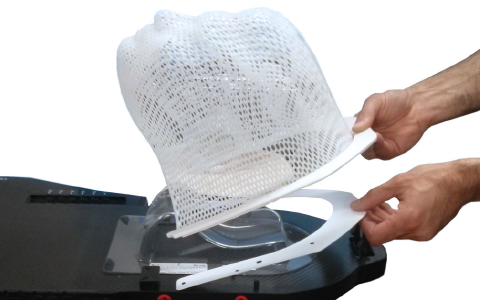 The LT-Thermoplastic Cup with Strap is an accessory that provides customized supportive lift to a treatment breast aiding in the avoidance of any unwanted fold during the radiotherapy treatment. Adverse moist desquamation can be reduced when skin folds are minimized. 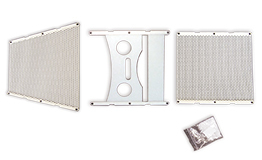 To activate, heat up in hot water or Dry Heater and mold to fit, support and let cool. Secure after molding mark and tape into place to ensure reproductivity. 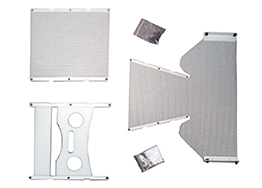 LT-Thermoplastic™ perforated 12″ x 24″ chest mold in use with the SaBella Flex™ (SBS14-PLV). Click here for more information. 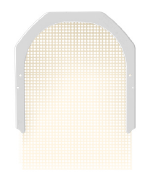 The SaBella Flex™ Head & Neck module allows for masks to be attached using CDR’s unique 5 point clamp (SBS14-HNM). Click here for more information. SL24-S LT-Thermoplastic Drape Type – 2.4mm Standard 5 ea. SL32-S LT-Thermoplastic Drape Type – 3.2mm Standard 5 ea. SL32-SL LT-Thermoplastic Drape Type – 3.2mm Long 5 ea. SL24-SXL LT-Thermoplastic Drape Type – 2.4mm Extra Long 5 ea. SL32-SXL LT-Thermoplastic Drape Type – 3.2mm Extra Long 5 ea. SL24-S-HYB-O LT-Thermoplastic Hybrid open face/Drape Type 5 ea. SL24 LT-Thermoplastic Standard Type – 2.4mm 5 ea. SL32 LT-Thermoplastic Standard Type – 3.2mm 5 ea. SL48 LT-Thermoplastic Standard Type – 4.8mm 5 ea. SL24-XL LT-Thermoplastic Standard Type – 2.4mm Extra Long 5 ea. SL32-XL LT-Thermoplastic Standard Type – 3.2mm Extra Long 5 ea. SL24-L LT-Thermoplastic Standard Type – 2.4mm Long 5 ea. SL32-L LT-Thermoplastic Standard Type – 3.2mm Long 5 ea. ST32-01 LT-Thermoplastic Shoulder Tech – 3.2mm 5 ea. PH08-MSET LT-Thermoplastic Prone Head & Neck Mask set (SL32 and SL48) 1 pkg. BL410 LT-Thermoplastic BL-Type – Head, Neck & Shoulder Type 5 ea. BL406 LT-Thermoplastic BL-Type – A Type 5 ea. BL408 LT-Thermoplastic BL-Type – B Type 5 ea. 10” x 15” / 254mm x 381mm 10 ea. 18” x 24” / 457mm x 609mm 10 ea. 24” x 36” / 609mm x 91 mm 10 ea. MSHIM Face Mask Shims Thickness: 0.5mm 6 ea. MSHIM-I Intuition ClickTM Shims Thickness: 0.5mm 3 ea. 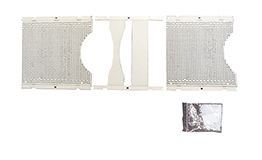 HSHIM Silverman Head Support Shims Thickness: 0.5mm 3 ea. Reusable Handles attached to Perforated LT-Thermoplastic Sheet. Shown here on the SaBella Flex™. All LT-Thermoplastic sheets are manufactured using the most current and advanced processes available, ensuring the highest consistency with respect to stretch, working time and ultimate patient comfort. The sheets come in various sizes and thicknesses, ranging from 1.6mm to 4.8mm, and are available in both Solid and Perforated types to ensure maximum accuracy and comfort. Simply attach a set of reusable handles to the LT-Thermoplastic sheet and attach to the frame (example shown here on the SaBella Flex™). Once treatment is complete, retain the handles for reuse and recycle the used LT-Thermoplastic. 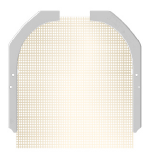 All LT-Thermoplastic products – including Perforated and Solid Sheets – are dry heat compatible (see Dry Heat Ovens). RS16-12×18 LT-Thermoplastic™ Sheet – Perforated 12” x 18” 1 ea. RS16-18×24 LT-Thermoplastic™ Sheet – Perforated 18” x 24” 1 ea. RS16-18×24-01 LT-Thermoplastic™ Sheet – Solid 18” x 24” 1 ea. RS20-18×24 LT-Thermoplastic™ Sheet – Perforated 18” x 24” 1 ea. RS20-18×24-01 LT-Thermoplastic™ Sheet – Solid 18” x 24” 1 ea. RS32-12×18 LT-Thermoplastic™ Sheet – Perforated 12” x 18” 1 ea. RS32-18×24 LT-Thermoplastic™ Sheet – Perforated 18” x 24” 1 ea. RS32-18×24-01 LT-Thermoplastic™ Sheet – Solid 18” x 24” 1 ea. Most of our products are available in MR Compatible version. Click here to download MR Compatible products details or contact us for more information. We offer live or onsite demonstrations.